Time Technoplast had an up Flag formation on 17 March 17. I have reproduced below the article of analysis done on 17 March. The up Flag formation in Time Technoplast has made the stock move from the then price of 116.45 to 208.9 today. That's a gain of 79% from the recommended price of 116. Keep reading this blog for more such analysis. My analysis is based on simple thought process. As all of us know that one has to have patience in stock markets, so is the case here as well. However, my thrust is on taking minimum risk. A CAGR of 40%-50% is what I look forward to. I thrive to have stocks in my watchlist and pick them up when I feel they are ready for an up-move. 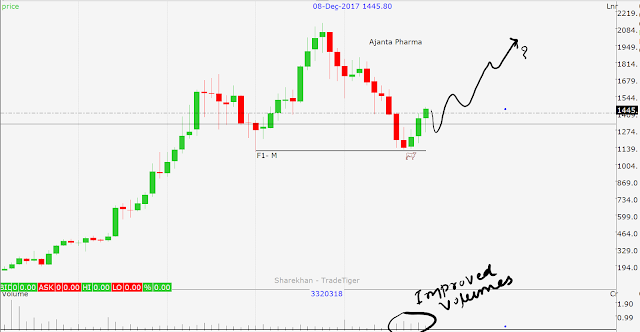 Update - Wockhardt Pharma - Accumulation in progress? You might recollect analysis of Wockhardt Pharma on October 9, 2017. The accumulation is usually followed by a sharp rise in price, as was mentioned in the analysis. The stock is currently trading near 880. On Oct 9, at the time I wrote this analysis, the stock was trading near 635. Enjoy the gains. Wockhardt Pharma - Accumulation in progress? Wockhardt Pharma fall from its high in Apr 2015 is almost 80%. That took the stock to an attractive buying price with an 80% discount. Currently stock is trading near 635. Many would want to accumulate this share at current price. This is precisely what is seen on the chart. After a mega fall there is a consolidation on chart. This consolidation might be due to steady buying at currently levels. This buying may take the stock to higher levels. The next hurdle is at around 830. If the stocks breaks this hurdle successfully, the next one is around 1250. This might take couple of years. I would trade this stock with a loss exit of around 540. Company is in manufacturing drugs. Company has almost zero debt. Stock is now trading at a PE of 27. The first chart below is a daily chart showing the chart area between Aug 2014 till date. You can see a horizontal line marked on the chart. This line acts as a support. This also means that buying was expected to start near support. Rightly so the stock bounce up from the level of 1130. The second chart below is also a daily chart showing a closer picture. We know that stock moves in repeated cycles of downtrend, sideways trend and uptrend. Once the uptrend starts it is expected to continue for some period of time. 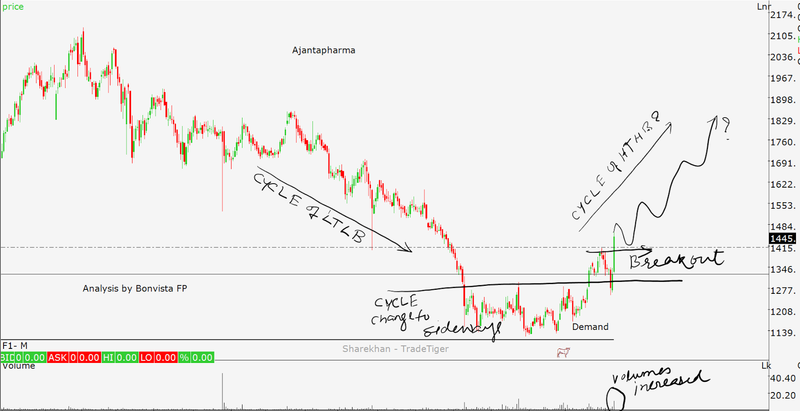 You can see similar Cycle of LTLB (downtrend represented by Lower Top Lower Bottom) followed by a Sideways Cycle and then beginning of Cycle of HTHB (uptrend represented by Higher Top Higher Bottom). A breakout on 20 Nov and 8 Dec are confirming the start of upward trend. This is also confirmed by the improved volumes on chart. Last chart below is a monthly chart. The stock has fallen from around 2120 to level of 1130. This is almost 50% fall from its top. 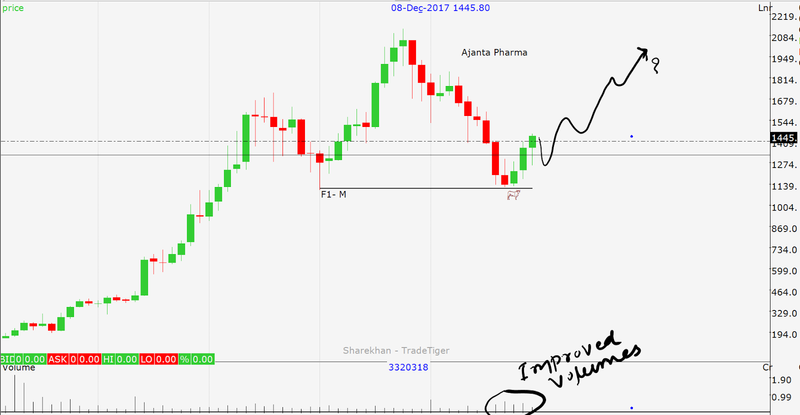 We can assume that the correction cycle of Ajanta pharma is now over and the uptrend started may continue for substantial period to come. When I wrote this article, the stock was trading near 1445. If one starts accumulating the stock at current level and wait for period of 1-2 years can reap returns of 70-80% on amount invested. We have seen a lackluster performance from sugar sector in recent past. At least currently it is not moving the way it was during June 17 to Oct 17. The sector as a whole and the stock (Dwarikesh) corrected substantially in last 2 months. Question is whether the opportunities are over in this stock or we should treat this correction as entry opportunity. 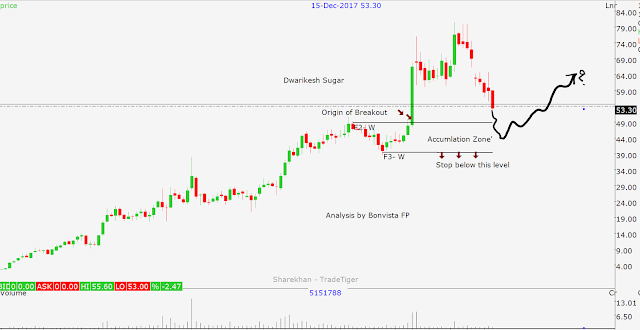 You can see the weekly chart of Dwarikesh Sugar below. On this chart you can see that the stock is falling ( correcting) since beginning of Nov 17 when it was trading around 79. It is still not giving the symptoms of recovery. Now the stock is trading near 53. This is a fall of more than 30% from the high. You can see a range named 'Accumulation Zone' marked on chart. 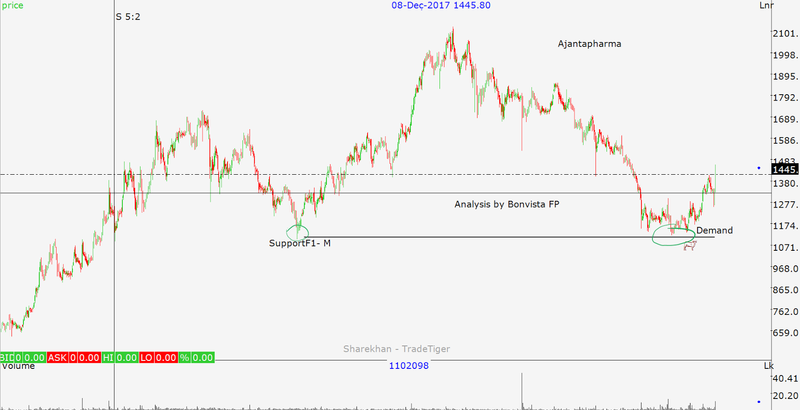 This range is a support area. One can expect buying to start in this zone. One can start buying Dwarikesh Sugar when it trades between 48 and 39. Place the stop just below 39 and exit, if it falls below it. The stock can see an upside of more than 40% from the recommended buying level.